Bank Of America Is 'Sticking It' To Customers, Senator Says : The Two-Way The No. 2 Democrat in the Senate doesn't like the bank's plan to charge many debit card customers $5 a month. 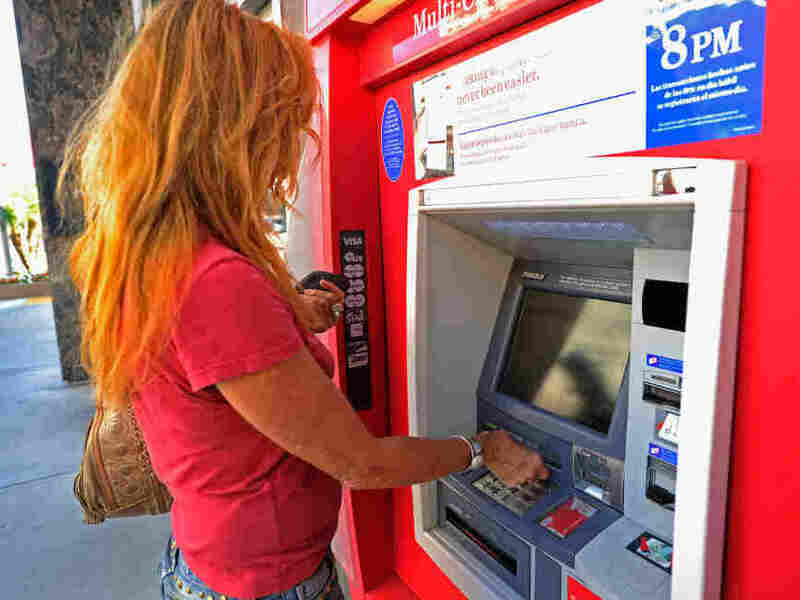 A customer uses a Bank of America ATM in Los Angeles. The bank plans to start charging a $5 monthly fee for customers who use their debit card for purchases starting early in 2012. ATM transactions would still be free. "It seems that old habits die hard for Bank of America. After years of raking in excess profits off an unfair and anti-competitive interchange system, Bank of America is trying to find new ways to pad their profits by sticking it to its customers. It's overt, unfair and I hope their customers have the final say." On CNN this hour, though, billionaire Warren Buffett — who this year invested $5 billion in BofA — said that the bank, like others, will be charging fees "of one sort or another" and that consumers surely know that "if somebody offers a better deal," they can certainly go to another bank or financial institution to get a debit card. "It's just like you can change channels on a television," Buffett added. While BofA and other banks that are experimenting with debit card fees say they're doing so because new regulations are limiting how much they can charge merchants for transactions, Durbin said the fees have been excessive and needed to be reduced.